So maybe you’ll never be able to fly around in an invisible jet like Wonder Woman. 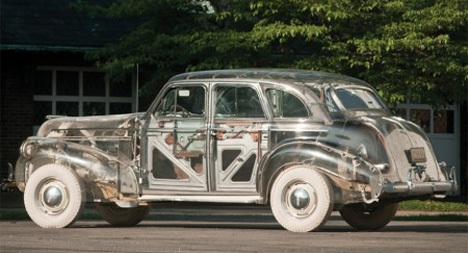 That’s okay, because now you have the chance to own a completely rad 1939 transparent Pontiac. It was built as a promotional car to show the inner workings of an automobile at the New York World’s Fair. 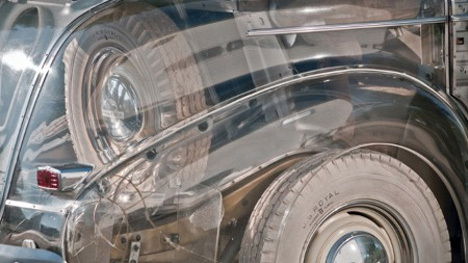 Back then, Plexiglas was a brand-new high-tech material, and the car’s entire body is made out of it. The underpinnings and mechanical parts of the car are all just like they would be in any other vehicle, and in fact the car is fully operational. The odometer shows 86 miles and it’s still got its original white rubber show-car wheels. 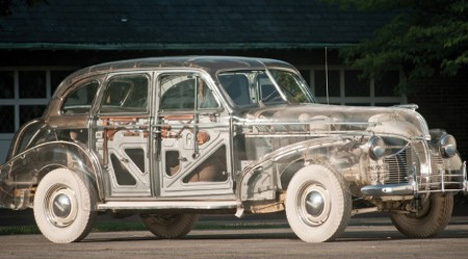 The “Ghost Car” was the first full-size transparent car ever, and it’s now up for auction. Its value has been appraised at between $275,000 and $475,000. That would be just about equal to the cost to build the car in today’s dollars – so maybe transparent cars aren’t the best investment strategy. See more in Art Vehicles or under Transportation. June, 2011.